Bruno Tonioli is missing this weekend's Strictly Come Dancing shows due to "a very busy work schedule". It will be the first time the judge has missed the shows in his 13 years on the panel. 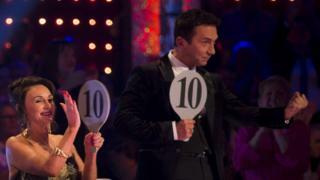 A Strictly spokeswoman told the BBC: "As was always the plan, Bruno Tonioli is not on the judging panel this weekend". He will return next weekend for the Halloween special and will be on the show for the rest of the series. It has been confirmed that 61-year-old Tonioli will not be replaced with a guest judge. This means fellow judges Shirley Ballas, Craig Revel Horwood and Darcey Bussell will have more sway when it comes to giving points to contestants. As well as his role on Strictly Come Dancing, Tonioli is involved in its US counterpart Dancing with the Stars. Tonioli explained on Twitter it was a clash with that show that led to him missing Strictly. He replied to a fan, saying: "100% back next week just had a clash whilst in @DancingABC." When asked if that meant the American show was "more important", he replied: "Far from it!". Dancing with the Stars is currently in its 25th season, with contestants including singer Debbie Gibson and Malcolm in the Middle's Frankie Muniz.